1. How will we group students for instruction? Whole-group? Small-group? Both? 2. Will we configure the learning to include stations or center? 3. In what "space" will students be working? Online, face-to-face, or combination (blended)? 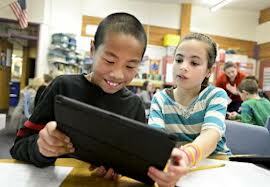 We can use digital technologies to create optimal environments for students and teachers to engage in deep learning. Students rotate on a fixed schedule or at the teacher's discretion. ​Individual Rotation does not require students to go to every station. A La Carte courses require an online (not face-to-face) teacher of record.